5L260 FHP V-Belt | Light Duty 5L-260 V Belt, Consumer Brand. 5L260 FHP V-Belt. 5/8” W x 26" Overall Length. Consumer Brand. GATES 3260/5L260 Truflex V Belts. 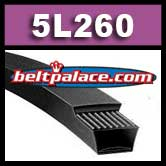 Classical B23 V Belt on light duty applications. Can be used for Harbor Freight Appliance Hand Truck, Haul-master Appliance Dolly "skid" belts on ITEM 62467, Part: 15460 (2 used).